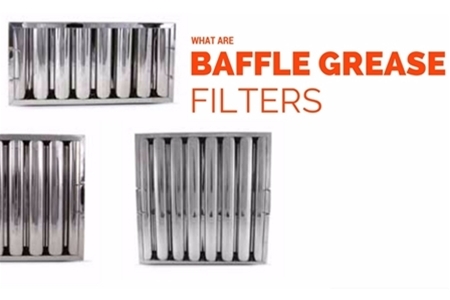 What is a Baffle Grease Filter? Home / What is a Baffle Grease Filter? Baffle grease filters are the initial step to managing commercial kitchen grease and regulate exhaust ventilation. 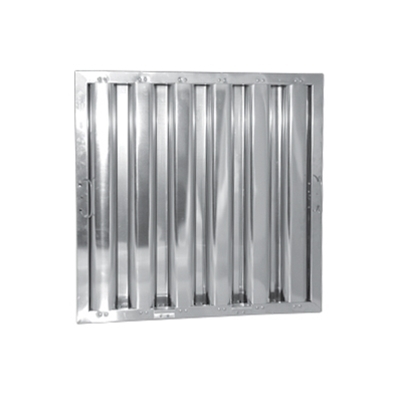 When installed properly, they safely guard the exhaust vents to keep flames or flammable debris from entering the ducts, and they capture grease vapors and particles to prevent them from building up in the ventilation system. These filters come in a wide variety of sizes and dimensions, and can be made from high quality stainless steel, galvanized steel, or aluminum. 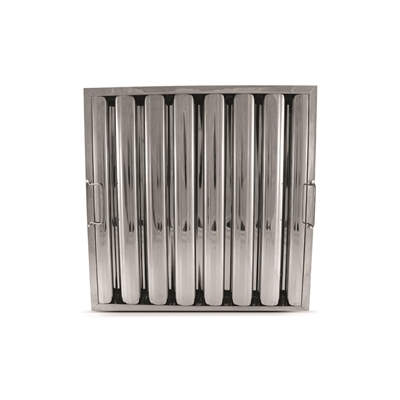 These standard filters can be welded or riveted, while some speciality filters may be constructed differently to serve their specific purpose safely and efficiently. When you cook on a stove or using other methods, smoke, steam, and grease are released into the air. 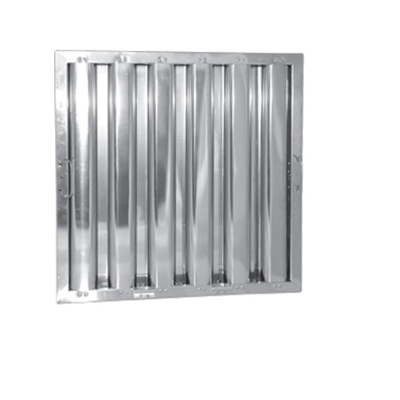 The interlocking baffles of the filter channel this air by simultaneously forcing it in two different directions, passing it through the strategically placed vertical blades and causing the grease to naturally run downward and into the designated collection trays within the casing, sanitizing the air. This prevents major fire hazards and is required by the National Fire Protection Association (NFPA), International Fire Code (IFC), and insurance providers, and is heavily enforced by health inspectors and fire marshals. Mesh hood filters are no longer accepted or allowed under the newest fire codes, so be sure to find the right size and material baffled grease filter for your kitchen to comply with the current standards. 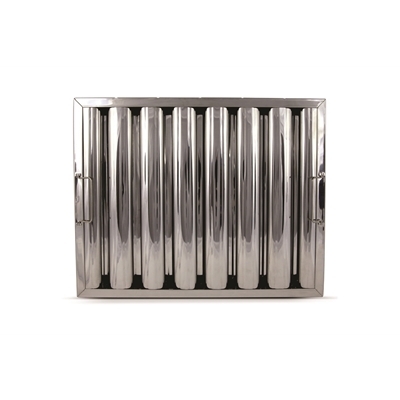 Stainless steel filters are often the best choice for their aesthetic appearance if your kitchen is visible to customers because of their shine and reflective finish. They also offer the maximum protection against corrosion and rust. Galvanized options are also available, and depending on the volume and use of your kitchen, the lighter weight and less expensive aluminum filters may be considered as well. Of these three options, stainless steel will be more expensive, but their durability and their lasting capability can help save you in replacement costs in the future. Baffle grease filters should fit the exhaust with no gaps or spaces between them to prevent grease and debris from passing through. It may be helpful to have a local professional test your system and adjust the settings correctly to avoid turning the exhaust fan up too high. This is to prevent your filters from getting sucked up into the hood. While the most important function of a baffle grease filter is to prevent fire hazards and adhere to fire, health, and safety codes, they are also beneficial to utility costs, kitchen cleanliness, and the exhaust system itself by easing the strain on the motor. It also keeps the air properly filtered and sanitized, which results in a cooler kitchen and healthier breathing environment. In addition, it removes odor build up that could give your kitchen a stale smell. These filters can be easily cleaned by hand washing them with hot water, soap, and a scrub or sponge that is not abrasive, or can be put in a dishwasher or soak tank using soap or a non-corrosive cleaner. Regular cleaning his highly suggested to prevent build up that could become a fire hazard and to prevent erosion. Cleaning schedules should be determined by the kitchen's volume of use, and may be required weekly or even daily. During routine cleaning, inspect your hood filter for any corrosion, warps, dents, or holes to ensure it does not need replacing. Avoiding the use of bleach and harsh chemicals can prolong the life of the filter and prevent these damages. Hood filters can be fitted with many different accessories, such as hooks, spacers, and bosses, and may require these accessories depending on the size and style of your hood system. Specialty filters such as spark arrestor filters, hinged filters, and captrate filters may also be considered for your kitchen's needs. 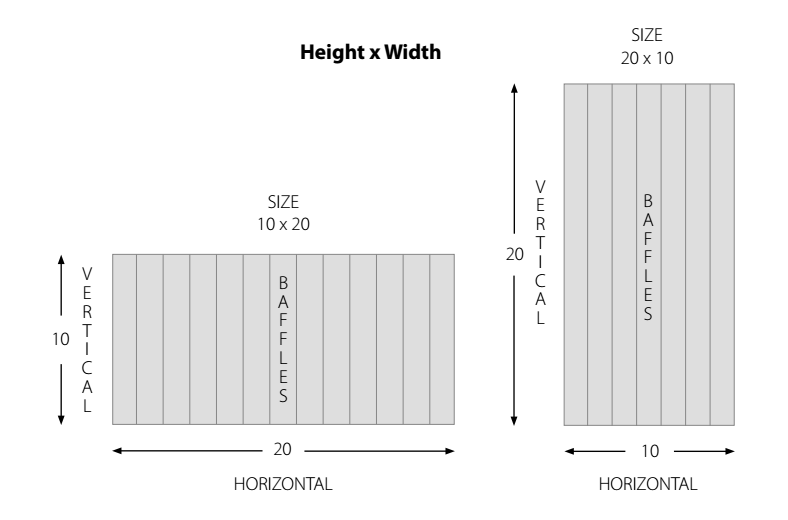 You can measure your hood and order the necessary filters per your dimensions and needs, or seek a professional's assistance to ensure efficiency, safety, and code compliance. 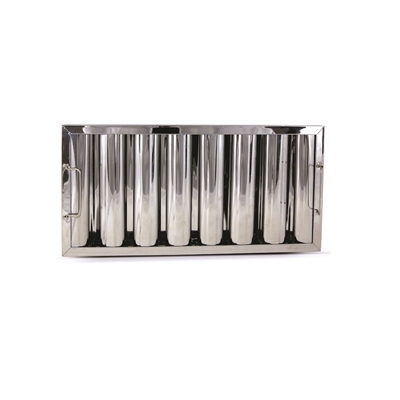 While they are an investment and require maintenance, quality baffle grease filters should be a high priority and should be installed as soon as possible to appease inspectors, meet codes, and provide a safe and sanitary environment for your kitchen staff and customers.